I freaking love this “salsa”. Okay, it’s not quite a salsa in a traditional sense, but damn if you don’t give me a bowl of this and some tortilla chips and I don’t practically pee with delight. 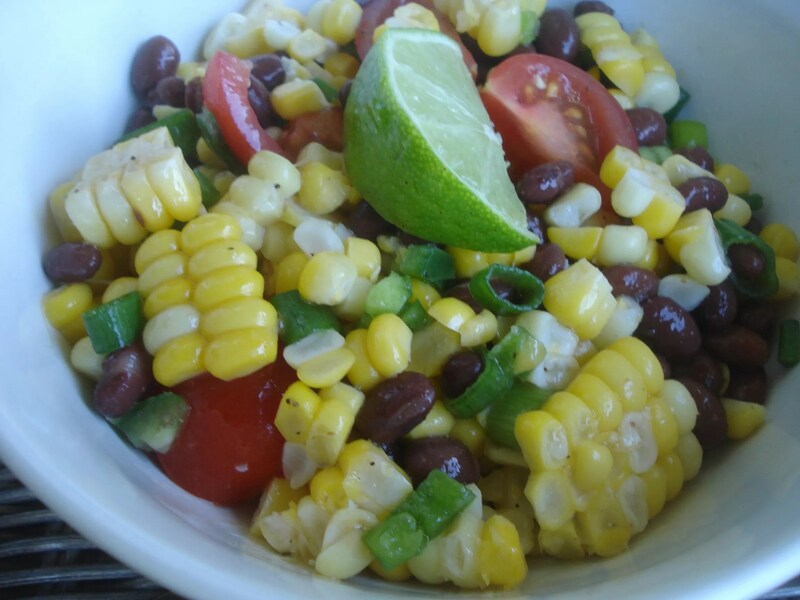 I love the tangy dressing, spice of the jalapeno and sweetness of the fresh corn. So, fine. It’s not summer yet. Not even close. But fix yourself up some of this, and you’ll almost be there. For the dressing, shake all of the dressing ingredients together in a jar with a tight-fitting lid. Cook the corn in 6 quarts boiling water until tender, 5 to 7 minutes. Drain and rinse under cold water. Cut the kernels from each cob into a large mixing bowl using a paring knife. Add the tomatoes, beans, scallions, cilantro and dressing and toss. Season with salt and pepper to taste. I like to serve this with chicken tacos, grilled fish, or just with tortilla chips for dipping. To cut the corn from the cob, stand it up on one end and cut down vertically from the top. Rotate corn to cut all sides. Make sure you have a firm grip on your corn so you don’t cut yourself! They can be slippery little buggers. Make sure to rinse and drain your beans really well. The liquid they come in does not make for good eats. I don’t particularly like cilantro, so I left it out. No harm, no foul.